Getting around by bike is a beautiful thing. As you plot your next travels, I hope that you'll look to the lovely Mike and Nancy of The Recumbent Gourmet for inspiration. Mike and Nancy are proof that there are many routes to living a more mindful, car-light life. Their blog tracks their cycling sojourns--and all the good eats that they find along the way. For those of us on the East Coast, we still have a good month and a half left before icy roads and biting winds make biking a rough go (so get out and ENJOY!) For those of us on the West Coast, be grateful for temperate weather (so get out and ENJOY!) And each and every one of us can do our part to be a better cycling advocate. Supporting safer roads, more bike lanes, and a culture of bipedal transportation is both better for the environment and a boon to social bonds. 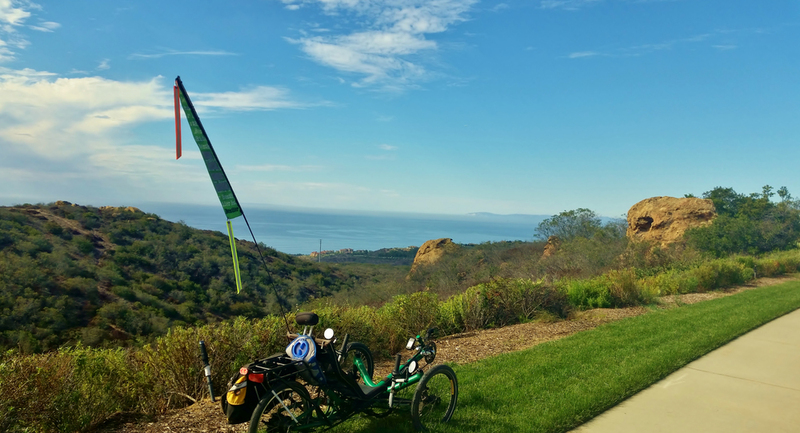 Herewith, an interview with Mike and Nancy about their recumbent travels. (1) What inspired you to start Recumbent Gourmet? Well, it’s basically the story of our life. We were living the life I think most Americans live – we both worked, we were traveling for business a lot, we didn’t get much exercise. I got really fat – I weighed over 300 pounds at one point. I was totally stressed out and I really kind of stopped enjoying the life I was living. Cycling was something I’d always done – as a kid we biked everywhere in the little town I grew up in. In college and before my career got really crazy, I rode for fun. I made a decision to carve out some time for cycling in my life. After a very short time it made a gigantic difference – I lost some weight, I felt better, I was calmer and life felt more livable. Food has always been kind of central in our lives. Both our mothers were good cooks, and passed that on to us. Nancy has always gone to great lengths to prepare healthy and delicious meals for us. But after I started cycling, food became a bigger issue in some ways. Mostly because I was seriously hungry – riding will build an appetite quickly. A few years ago, Nancy also started riding and then got pretty serious about rides. We both ride, ride in charity events, to restaurants, to hotels, and it grew from 10 miles to day-long rides to somewhere we want to go. We have gone together to San Diego from Newport Beach, California. We have also ridden to Santa Barbara from Newport Beach so we have gone for days with just the clothes we take with us. Now we ride with our dog, McCartney in a trailer with us. Recumbent Gourmet just grew from that change in our lives. I ride my bike a lot, Nancy loves to cook, and we go shopping, find fun places to visit, have a great ride, and cook a really good party meal for a group of people, whatever. Because that is our experience, it’s what we talk about with our friends. And it turns out we really love telling the stories, and at least some of our friends liked hearing them. (At least don’t try to change the topic when we talk about them). So The Recumbent Gourmet is just kind of an extension of the way our life evolved. (2) What does it mean to you to live a "car light" life and how can each of us aspire to bike more, drive less? I know some cyclists that have given up driving a car altogether – essentially they have gone ‘car-free’. I have not been able to do that. There are things I do in my life that I can’t do without a car – visiting friends and family that live a long way off, carrying big heavy stuff that won’t fit on the bike, arriving to a nice restaurant without being sweaty – stuff like that. Basically, I try to use my bike for anything that I don’t really need a car for. When I was working, I would commute on the bike. If I can use the bike to run an errand, I will. I’ll go shopping with the bike. I get a kind of odd thrill about finding a way to use the bike for something that most people use a car for. I call that living ‘car-light’. I ride a lot more miles each year than I drive. It saves a lot of money – cars are expensive to run. So I spend less on gas and maintenance. Even my insurance got cheaper because I drive so few miles. It’s better for me – I am much healthier than I might be if I didn’t ride, and I get to see the world a lot differently. It’s surprising how much of the world you do not see when you drive through at 60 MPH. At 12 MPH on a bike, there is a lot more to the world than you might expect. And it’s better for the environment – we have managed to reduce our carbon footprint quite a bit. It is actually not a difficult life style change to make. The lycra-clad go-fast road cyclists are what most people associate with the sport of cycling. But that's not what we do at all – we go as fast as we are comfortable going, which is actually pretty slow. You don’t need to be some kind of uber-athlete to utilize a bike for practical stuff. Look at me – I’m basically a bald, overweight, middle aged guy. But I can do this. If I can, I really think anybody can. Time is the biggest challenge most people will face. It does takes longer to do stuff on a bike than in a car. Riding a bike kind of forces me to slow down and do things more deliberately, live a slightly less hectic lifestyle. For me that’s the biggest benefit of the life we are leading now – I have time to breathe and think about what I’m doing. (3) What are the kinds of challenges you face as a bicyclist? I already talked about time – being able to find enough to ride instead of drive. That’s pretty important. Weather is another important factor. We have chosen to live in places where the weather is pretty nice – for the last 25 years we lived in North Carolina, Southern California and now Florida – all places where there isn’t any significant winter. There are people that ride bikes all year round even in winter climates – but I don’t think I could do it. Another challenge is finding places that are safe to ride. Riding a bike is actually not particularly dangerous – but there are some risks involved, and learning how to minimize those risks is important. And there are some roads that really cannot be ridden – either because it is illegal (like interstate highways), or because there is just too much traffic traveling too fast to make it reasonably safe. I’ve ended up getting involved in a lot of cycling advocacy efforts – finding more and better ways to make places accessible to cyclists, and to educate both drivers and cyclists about safe cyclist practices. (4) Take us through your most recent Recumbent Gourmand adventure. Two weeks ago I traveled from our home near Sarasota to St. Augustine on my bike. Took me a week to ride up there. I carried a tent and sleeping bag and I camped most nights. There are some very cool little towns in central Florida, and for a couple of nights I stayed in Bed and Breakfasts and went out to explore. I was surprised to find these little towns, away from the busy tourist areas in Florida, had some remarkably good restaurants. In DeLand, a town of maybe 27000 people, I found what may be my favorite wind bar ever. Kind of like the bar in ‘Cheers’ – everybody knew everybody, the customers brought their dogs in. It was a like a little party. I loved it! I never expected to find anything like that. Those kind of surprises are always so much fun. Nancy and Mac drove up and met me in St. Augustine, and we spent a few days exploring the city. I’ve never been there before, and it was a blast to learn about all the history there. And of course, we checked out some great restaurants while we were there. (5) What would you like people to get out of your blog?